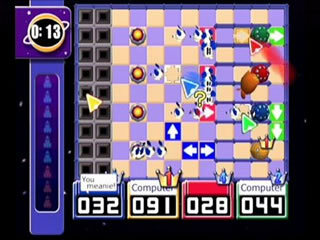 Chu Chu Rocket was one of those rare things like Lemmings – a totally original game, with a brilliant multiplayer mode. It’s a damn shame that it didn’t achieve the success it so richly deserves – such was the popularity of the Dreamcast. Chu Chu Rocket was launched halfway through the lifespan Sega’s brilliant but failed 128-bit console. It was given away to console owners to celebrate the Dreamcast’s online functionality. The purpose of the game was to guide the chu-chus to a rocket. This is done by placing either up, down, left or right arrows onto the gridded play area to guide the chuchus to your rocket. Of course, there’s also cat like creatures which kill the mice if they come into contact with them. The main game is a Lemmings like puzzle game with differing puzzles. It’s fun but it’s not going to keep you more than an afternoon. This game really shines in multiplayer. Specifically, offline multiplayer. We bought the Dreamcast when it was officially dead for £40 with four controllers and Chuchu Rocket. Even speding about a fortnight scouring the North Wales coast for all four of the Dreamcast games released, Chuchu Rocket was undoubtedly the most fun. Muliplayer involves four different rockets, and you have to guide the most mice to your rocket to win. It is quick to pick up and play, and anybody would win. It’s strikingly similar to Bomberman, except less violent. Online multiplayer was a bit of a disaster though. It’s fast paced gameplay wasn’t suited for 56k dialup connections and the server didn’t help that was slow and pathetic. If only if it came out on the Wii or something, then this game could get the recognition it deserves. However, until that joyful day, the best you can hope for is getting the game and a console off ebay or something. It should be less than £30, and it’s well worth getting for a game to play when you’re bored with your mates. It’s ace.